The earliest restore point is 27 August 2013. This seems strange as I did have a technician re-install XP but that was 2-3 years ago. There has been a noticeable drop in performance post August 27 so do you think I should try that date? There are two options on that date "software distribution service 3.0" and "system checkpoint" which is about 10 minutes earlier. Even if it means repeating some steps that would be acceptable. Your system removes old restore points periodically. The date you choose is up to you, the further you go back the potentially more updates and newly added software you will have to re-install. You are just trying to restore to before the malware issues started. Keep in mind restoring will not correct the lack of system resources issue. The preferred restore point is probably the "system checkpoint". I might have had malware issues before August without being aware, that could have been contributing to a lack of performance and errors correct? It doesn't sound like I've anything to lose from trying at the very least shut down might work properly again. I'm just trying to give you any information that will help you determine what restore point you would like to select, which date to choose is your decision. Will emails in OE be deleted or retained? What files are changed during a system restore? 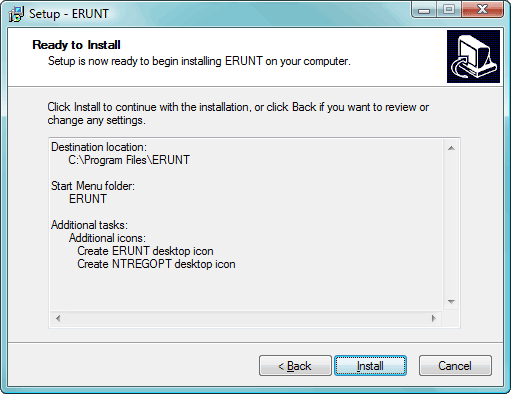 System Restore affects Windows system files, programs, and registry settings. It can also make changes to scripts, batch files, and other types of executable files on your computer. Note:System Restore does not affect personal files, such as e-mail, documents, or photos, so it cannot help you restore a deleted file. If you have backups of your files, you can restore the files from a backup. No available restore dates worked right through September & October as the message stated there were no system changes. I went as far as the first OTL restore point on November 4th but still the same message. I noticed the very slow ( 30 mins ) shut down started around time we started the processes, could there be a connection? After reviewing your logs from the beginning I noticed you have numerous what appear to be Skype Toolbar logs. Do you need to save them? I don't know if they are causing any issues but at this point I'm trying find anything that might be giving you problems. This symptoms are pointing to either corrupt system files or possibly a failing hard drive. Let's re-try System File Checker. I don't know what the skype toolbar logs are, although we did have skype installed until I uninstalled the other day. No I don't need to save them. I couldn't see a temp folder on the Lynda ( my Mother ) account. The command prompt window only appeared for a fraction of a second then disappeared. Then two windows came up one on top of the other stating "windows file protection". The PC will not allow me to take screenshots for you. One states "files that are required for Window to run properly must be copied to the DLL Cache". Then " Insert you Windows XP Professional service pack 3 CD now"
Edited by cousinkevin, 26 November 2013 - 04:21 PM. This seems strange as I have XP home SP 2 disk. The technician who reinstalled XP about 3 years ago said he didn't need the original disk. Could have he installed a non original version of XP? Not likely, if they are a reputable company. All he needs is an installation disk for the same OS you had installed. Your product key code is what differentiates your copy from another and the sticker may be mounted on your computer, they could just re-register the computer with the code. Or they possibly just installed a fresh copy (new CD & new product code number). Select the download button to install the software on your computer. Click Save to save the file to your computer, select a location of your choice. 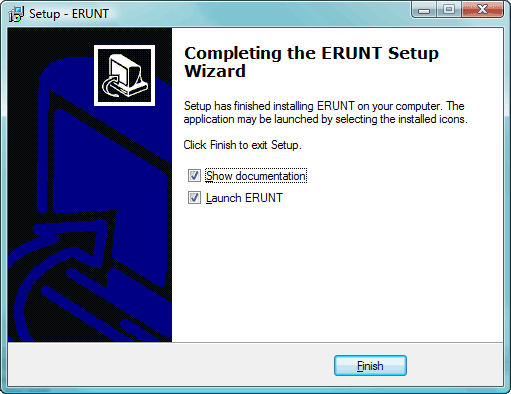 Double click the .exe file to launch the program, select Run. Post the results in your next reply. Put a check mark in the check box labeled "Display the contents of system folders". Under the Hidden files and folders section select the radio button labeled "Show hidden files and folders". If the folder is not present on your hard drive, load the Windows XP SP2 disk you have and see if it's located on the disk. Do you have the i386 folder? My copy of XP was validated as authentic. It got stuck for a bit but finally completed, I noticed the "cancel" button was greyed out ( oh sorry US spell grayed ). The "i386" was located on the XP disk. I couldn't see any skype toolbar files/folders in the temp folder after displaying hidden files & folders. Can you tell me the size of the folder? Before we proceed, we need to back up the Registry. 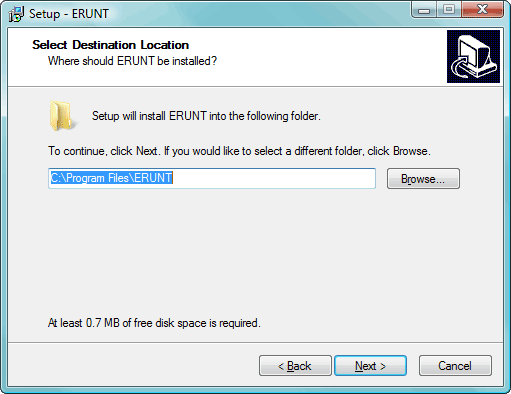 ERUNT (Emergency Recovery Utility NT) is a free program that allows you to keep a complete backup of your registry and restore it when needed. Compatible with Windows NT, 2000, 2003, XP, Vista, 7, 32 & 64-bit versions. **Remember if you are using Windows Vista as your operating system right-click the executable and Run as Administrator. 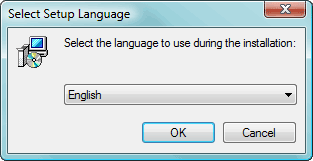 Select your preferred Setup language. At the Setup screen click Next. Accept the default destination folder by clicking Next. Accept the default Start Menu Folder. Accept the default Additional Tasks by Clicking Next. Ready to Install. Click the Install button. Say No to the portion that asks you to add ERUNT to the start-up folder, if you like you can enable this option later. Setup has completed. Tick the check boxes to Show documentation, or Launch. The first two check boxes are ticked by default (System registry and Current user registry). 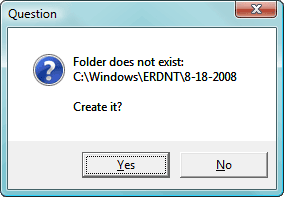 When prompted, click YES to create a new folder. Progress bars will show backup status. A confirmation window will popup when complete. Load your Windows XP SP2 CD into the drive bay. Remove the CD from the drive bay, then continue. 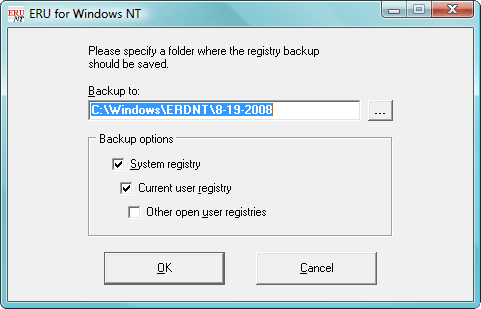 Double click the file to update the changes to the Registry. Completed tasks. I didn't see the word "code" to not copy into notepad as warned. I notice the .reg file is very small only 129 bytes does that sound right? SFC still freezes at "Windows File Protection" window and states "Please wait while Windows verifies that all protected Windows files are intact and in their original versions". Tried SFC several times again and the black box appears and disappears in a fraction of a second every time. Edited by cousinkevin, 28 November 2013 - 12:16 PM. Offline yesterday due to Thanksgiving I appreciate your patience. So it's safe to say it doesn't appear to be completing the scan, correct? Has there been any change in performance?